Can Publishers Cash In on Video Gamers? The game L.A. Noire has sold 1.5 million copies worldwide. If Mulholland Books gets even a fraction of that audience to buy its companion book of fiction, it will surely cash in. The video game industry is a behemoth. In financial terms, it represents some $10.9 billion in revenue in the US, according to the latest statistics from 2009. (Which is still only a third of the approximately $30bn generated by the US book business each year). Demographically speaking, gaming is reaching a broad and mature audience: the age of the average gamer is 34, and 40% of them are women, with 64% of US households playing games. What’s more, the typical gamer spends eight hours a week playing games — or about an hour and 20 minutes a day. All in all, it’s a very appealing audience for publishers to pursue. Granted, there is bound to be overlap — but what more can publishers do to tap into the audience of gamers, one that is more than willing to spend lavishly on its hobbies? Think of how many successful games have been able to extend their franchises by offering sequels, original downloadable content, and additional storylines? Publishers could certainly tap into this market. The publishing industry already does extremely well publishing game guides. Now, as discussed in today’s feature story, some are experimenting with trying to get gamers to cross-over into reading related fiction as well. 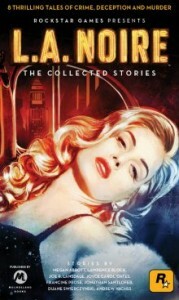 Mulholland Books, for example, is publishing an e-book original of short stories that expand the storyline of Rockstar Games’ new L.A. Noire title — a game that has already sold over 1.5 million copies worldwide, typically costing $40 or more, since its release last month. If Little, Brown can lure even a fraction of those gamers to purchase their e-original, that will create a powerful profit center. Click here for an infographic on video game statistics.